This summer at the site of the former Trump Taj Mahal, Hard Rock Hotel & Casino Atlantic City opened ushering in a new era of entertainment. And, what an opening is was! 500 million dollars went into the newly reimagined and refurbished property and it shows. 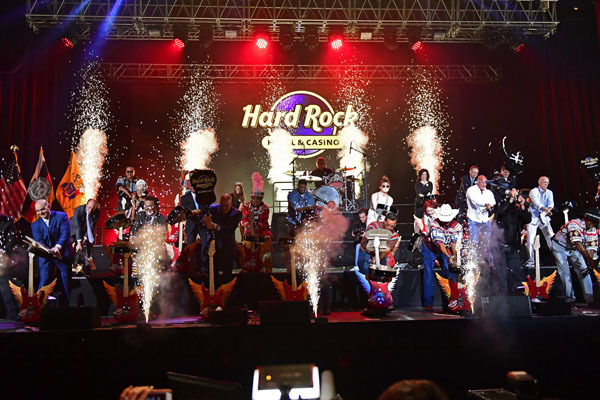 With venues in 74 countries, including 175 cafes, 24 hotels and 11 casinos, Hard Rock International is one of the most globally recognized companies. Beginning with an Eric Clapton guitar, Hard Rock owns the world’s greatest collection of music memorabilia which is displayed at its locations around the globe. The company owns, operates and franchises Cafes in iconic cities including London, New York, San Francisco, Sydney and Dubai, and manages hotel and casino properties worldwide. Hard Rock Hotel & Casino Atlantic City is set on 17 acres, with the legendary Atlantic City Boardwalk as its backdrop. Upon arrival, guests enjoy a new check in experience and lobby lounge. 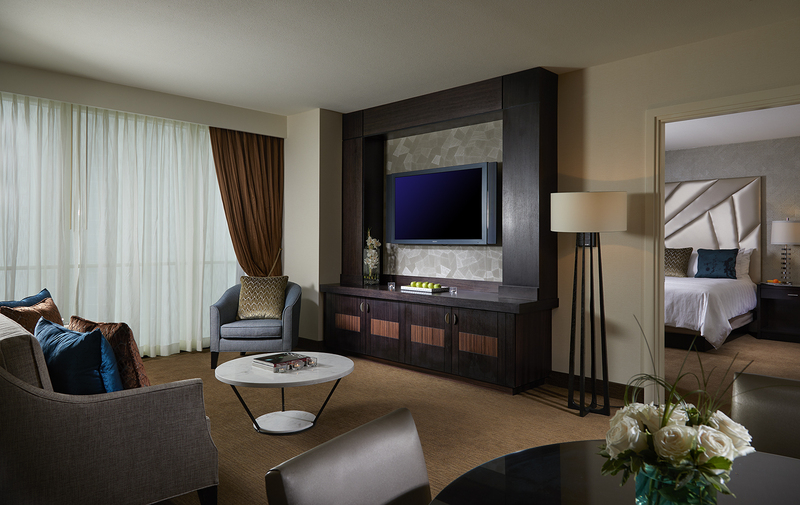 There are over 2,000 guest rooms and suites that offer lavishly appointed rooms in a relaxed and refined setting. Each of the hotel’s guest rooms and suites include Hard Rock’s signature“TheSound of Your Stay” music amenity program, which allows guests to set the mood with complimentary vinyl records or jam out on a Fender guitar in the privacy of their own room. Hotel guests can enjoy high speed, property-wide Wi-Fi, 24 Hour In-Room Dining, towel and chair service at Hard Rock Beach or at the indoor pool, and 24 Hour Access to Body Rock fitness. 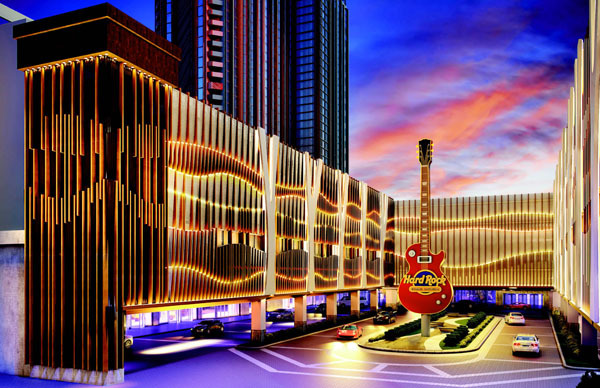 With Hard Rock International’s standing as curators of the world’s largest and most priceless music memorabilia collection, the property’s design is museum-like with memorabilia adorning the walls of the hotel. The displays were carefully hand-selected with a focus on contemporary musicians and artists who call New Jersey home. There are also meeting spaces that have been updated to accommodate both large conventions and smaller events, and a full-service spa that features relaxing and recharging treatments. The casino is well lit and lively, complete with more than 2,100 slot machines and 120 gaming tables. After enjoying some time at a table game, check out one of the hotel’s wide range of restaurants, from burgers at Hard Rock Café to gourmet Italian at Il Mulino. Then cap the night off with a visit to the high energy Daer Nightclub. Or check out the concert venue, where you will not find a bad seat in the house. Hard Rock International Chairman & CEO, Jim Allen asserted the hotel’s title as the new go-to destination for world-class entertainment, rock star service and their signature legendary vibe by throwing an opening with an energy that Atlantic City hasn’t seen in more than a decade. The event was headlined by Carrie Underwood, the former“AmericanIdol” winner that went on to become one of the foremost country artists of our time, and Pitbull or“Mr.Worldwide,” as he calls himself. The hotel’s new entertainment initiative is called 365 Live, which will provide 365 days of live performances which was launched during the star-studded grand opening weekend. 365 Live will feature national touring acts including performers from American Idol, The Voice, and America’s Got Talent. Hard Rock will bring Grammy Award winners, comedians, and some of the biggest names in entertainment to grace the Boardwalk with their talents. The ambitious plan offers 50 live performances per week through August. On any given day of the year, musical talent will include artists that are leading the music scene across the nation. From country artists like Blake Shelton, Rascal Flatts, Toby Keith and Trace Adkins to Broadway sensations, such as Rock of Agesand Million Dollar Quartet, guests will have access to a variety of genres. Legendary artists like Frankie Valli and The Four Seasons and rock favorites such as Pat Benatar, Neil Giraldo and Rick Springfield are also booked. Performances will take place at one of the five performance stages across the property including the Hard Rock Cafe, Lobby Stage, Council Oak Lounge, Boardwalk Stage, and the Beach Stage. And look no further than the pool for Hard Rock AC’s Sound Waves poolside concert series. Everything was summed up well by Jim Allen, chairman and CEO of Hard Rock International.